Cute little hat. Which pattern did you use; i would like to knit it for my daughter who is expecting her first baby in December. Wishing you a happy time as you wait for your little son to arrive. I love that the yarn is called Calmer...will make for a calmer baby! I agree that a handmade hat is so much nicer. How precious. That is the best gift to a new baby. Did you knit a special baby blanket, I'm sure you did. What a special time. Good luck with everything and enjoy the baby. I just received the book and I love it! Thanks! LOVE the hat! Our daughter was just born last Saturday & she wore a hat my mother had knit. I'd love to have the pattern b/c our daughter is so tiny & most of my knit hats for her do not fit yet. Lovely hat and the yarn is perfect for it! I'm curious to know, did you design the pattern yourself? When my daughter was born 16 years ago the hospital gave her a handknit hat that was made by volunteers. It was beautifully knit and fit her newborn head perfectly, unlike the too-large strawberry hat that I had knit for her. That hat is so special to me - I still keep it in my dresser drawer and smile every time I see it. Your hat is perfect! Love it! Where cans we find the pattern you used? I used the Adventure Hat pattern from the book Math For Hats. 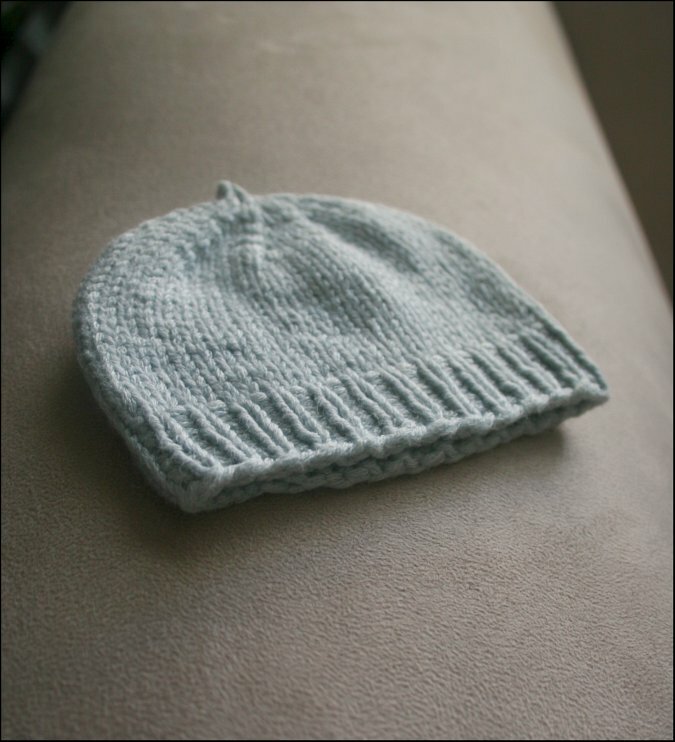 Simple hats are so comforting and anything you knit will be perfect for the baby. That is perfect, and so sweet. All the hats I made for my daughter were too big, but my best friend made her a hospital hat, and my daughter wore it everyday for 2 months. You will love that hat forever. This little hat is really cute!